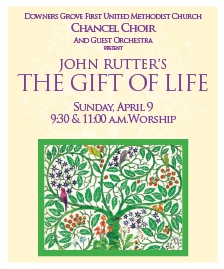 Join us on Palm Sunday, April 9 at our 9:30 and 11:00 a.m. worship services as the Chancel Choir, with guest singers and accompanied by a guest orchestra, presents John Rutter’s long-awaited new major work, The Gift of Life. This six-movement choral work is a celebration of the living earth, of creation and of life itself; offering a kaleidoscope of moods from contemplative and prayerful, to majestic and inspirational. This service will also include the traditional Palm Sunday children’s processional. We hope you can join us in experiencing this lovely piece!